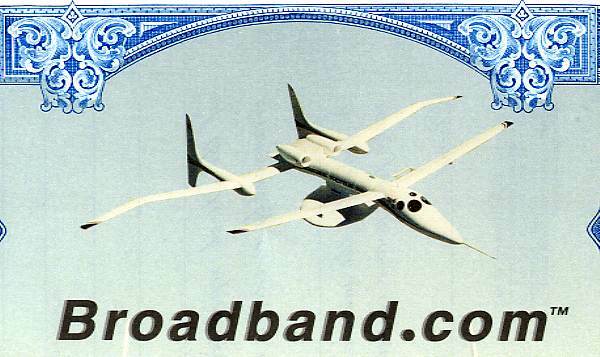 Beautifully engraved specimen Certificate from Broadband.com dated September 22, 1998 (The date of the Airplane's Inaugural Flight) . This historic document was printed by the United States Banknote Company and has an ornate border around it with a vignette and underprint of the HALO Proteus Airplane designed by Burt Rutan. The HALO Proteus Aircraft was included in the list of the "100 Best of the Century", by Time Magazine in April 1999 This item has the printed signatures of the company's Chairman, Marc Arnold and Executive Vice President and CFO, Bob Kerstein. 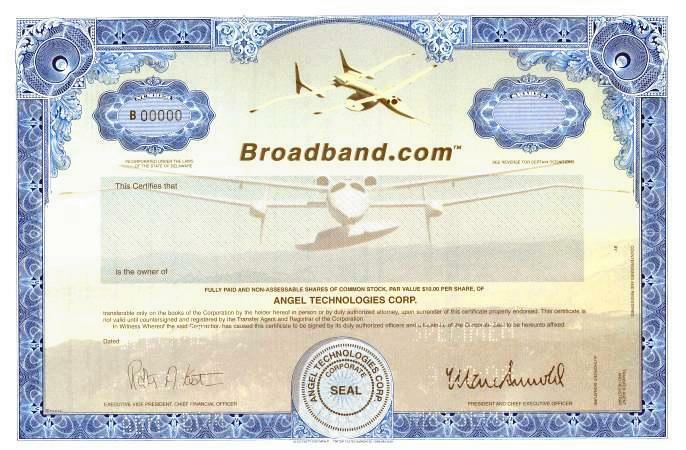 According the the company's website at angeltechnologies.com, Angel Technologies Corporation (Broadband.com) has its headquarters in St. Louis, Mo., and is a privately-held wireless communications company using proprietary High Altitude Long Operation (HALO) aircraft to deliver services worldwide. Augmenting terrestrial towers and orbiting satellites, Angel's HALO aircraft will fly fixed patterns in the stratosphere over major cities to deliver metropolitan wireless services at lower cost, with increased flexibility and improved quality of service. Teamed with corporate partners (including Raytheon), Angel will deliver a variety of fixed and mobile wireless services including voice, data and video. The HALO Network will enable individual consumers and businesses to send and receive data at multi-megabit per second rates. It will be replicated over metropolitan centers throughout the world. The HALO-Proteus aircraft has been designed to provide the commercial communication industry a reliable alternative infrastructure that can be deployed instantly, even when terrestrial infrastructure is missing or incomplete. Applications that will benefit most from the availability of airborne deployment will be new broadband data services in developed countries and wireless telephony services in the developing world. Equipped with suitable payloads, HALO-Proteus aircraft will deliver high-capacity, high-quality services while positioned 10 miles above metropolitan regions. The HALO-Proteus aircraft with its payload will create a cellular pattern covering an area comparable to several hundred cellular towers. "Given the business requirements proposed by Angel, we designed an aircraft for economical and reliable access to the stratosphere," said Burt Rutan, president, Scaled Composites and designer of the aircraft. "The Proteus has long thin wings like our Voyager round-the-world plane, but the similarity stops there. The Proteus� strong structure can withstand more G-force than a typical business jet. It has been designed from the start to be robust and reliable." "I�ve been around aircraft of all kinds. The Proteus is truly unique," commented Allan McArtor, former FAA Administrator and senior executive at Federal Express. "The HALO-Proteus has the potential to open a whole new segment of aviation, the carriage of data instead of people or cargo." The HALO-Proteus aircraft, named for the Greek god able to change its physical form at will, is a High Altitude Long Operation (HALO�) aircraft which sports a canard wing, an interchangeable center fuselage and twin fan jet engines. Angel Technologies Corporation and its partners are creating a wireless broadband "super-metropolitan area" network to interconnect tens to hundreds of thousands of subscribers at multi-megabit per second data rates. 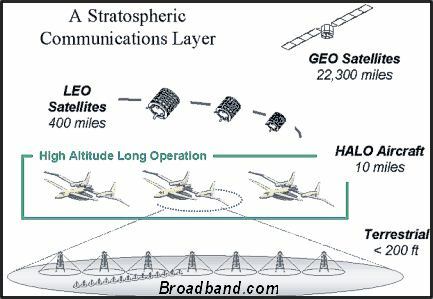 The HALO(TM) Network will offer ubiquitous access and dedicated point-to-point connections throughout a "footprint" 50 to 75 miles in diameter. A piloted, FAA-certified High Altitude Long Operation (HALO) aircraft will provide the "hub" of the network. Operating continuously over each market, the HALO aircraft will create a "Cone of Commerce(TM)" in which prospective customers will access broadband services irrespective of their locations. HALO Networks will be financed and deployed to select markets, on a city-by-city basis, around the world. The HALO Network will provide consumers with a broadband digital utility for accessing multimedia services, the Internet, and entertainment services. The network equipment at the subscriber's premise will be standards-based and employ a user interface as simple as today�s typical consumer modem. Consumers will be able to access video, data, and the Internet at rates ranging from 1 to 5 Mbps. Angel will offer higher data rates as the broadband market matures. 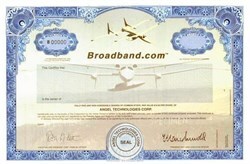 Broadband.com had revented itself to become the #1 Broadband provider in the United States. Broadband now offer service through traditional land services.